Hard-copy copies of “Music and Dance” (Second Edition) by Ken Hutchins are ready to ship. They are $35 each, and are sold to previous purchasers (one copy per customer) of the PDF version (First Edition) for $10. This Second Edition is 512 pages and measures 5 1/2 X 8 1/2 inches. It contains 170 color graphics. 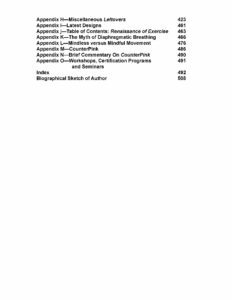 This Second Edition has one new chapter (“Specifically for Dancers”) and five additional appendices including “Mindful versus Mindless Movement” and “The Myth of Diaphragmatic Breathing” and one on the crookedness of the breast cancer industry. Also, crucial new information on diet and diabetes II management are embedded in a previously existing chapter. Domestic shipping and handling (media) rate is $8 for one to three books. Please inquire about shipping cost for more than three. For international shipping please inquire. For book purchases, write to ken@seriousexercise.com. 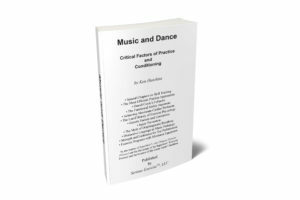 In his newest book, Music and Dance—Critical Factors of Practice and Conditioning, Ken Hutchins reveals the unflattering history of early physical education and exercise physiology that denied the present generation of musicians (and everyone else) a practical understanding of exercise principles and guidelines for mastering the skills of music and dance. Music and Dance—Critical Factors of Practice and Conditioning contains much new material absent from his earlier books plus refined explanations of material some readers have seen before. For the most part, this book is not as technical as The Renaissance of Exercise, but it does have sections throughout that require close reading. It also includes first-time discussions about inroad and cardiac perfusion that many exercise instructors will wish to add to their preliminary considerations. It strongly recommends The Renaissance of Exercise to readers who want deeper detail. Music and Dance—Critical Factors of Practice and Conditioning completes Hutchins’ odyssey to write for the music community. His initial foray into this area was a collection of articles submitted in 1976 to Ellington Darden, PhD, then Director of Research for Nautilus Sports/Medical Industries. These early articles were laid aside in 1977 for Hutchins to begin as Darden’s technical writer. 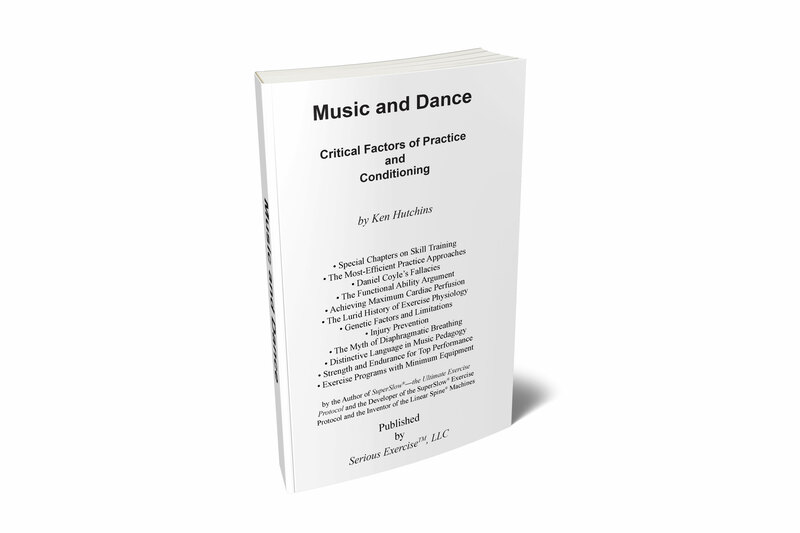 Music and Dance—Critical Factors of Practice and Conditioning is formatted to eventually serve as an eBook, although it is now only readable as a protected PDF on a desktop or laptop PC. No Macs are supported. Note that some of its links are not yet active and updated versions will be distributed as the new website at seriousexercise.com is completed. 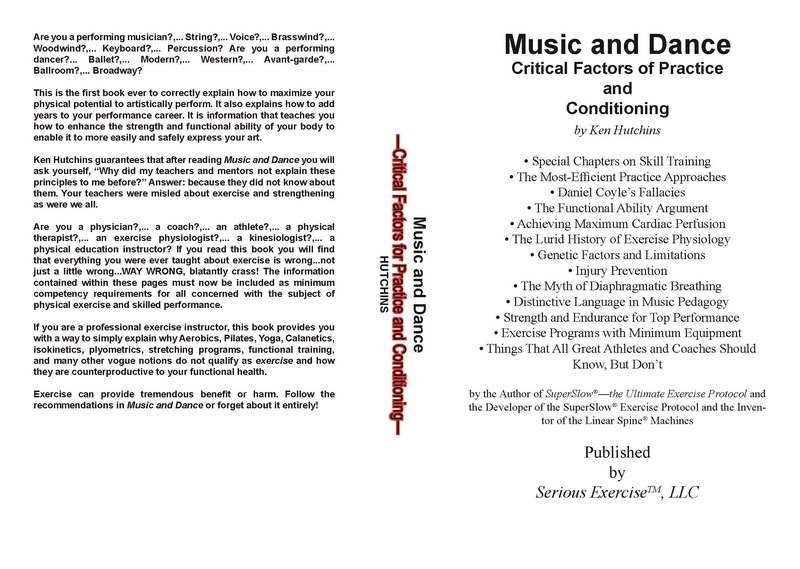 Music and Dance—Critical Factors of Practice and Conditioning is distributed through a CopySafe portal and read with a free download of the CopySafe Reader. The price per PC is $25.00. For information please email Ken Hutchins at seriousx@mycci.net. 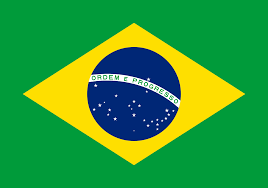 My name is Daniel, I live in Brazil, and have been a fan of Superslow Training for about 8 years now. 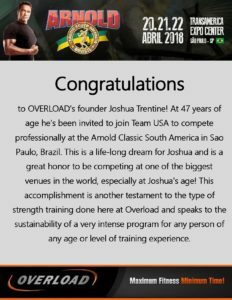 I just wanted to tell you about my training experience at Overload Fitness under the guidance of Josh Trentine. I train alone in a home gym as we do not have any Superslow studios in Brazil. The scarce knowledge I have about the technique comes from what I read in books ( Power of Ten, Slow Burn, Body by Science…) and in websites, most recently the Renex website. The articles on the Renex website written by Ken, Josh, Al and Gus are amazing. So I thought to myself, “why not pay a visit to Cleveland during my next vacation and “knock” on Josh and Al’s door asking for some training advice. I contacted them by e-mail and Kristina booked me a session in late September. First and foremost, I would like to strongly emphasize Josh´s attitude. He was very friendly from the get go and a real gentleman. His patience abounds and he really took his time to answer all all my amateur questions in the most detailed fashion. Another virtue of Josh is that he is very, very meticulous in presenting the right exercise technique. From the seating position on the machine and placement of hands and the adequate grip all the way to the right timing of a rep turnaround. You can feel his passion for the job. Josh put me through a series of Renex, Medx and Superslow machines which I found amazing due to their low friction, design and cam mechanics. I surely paid my dues in all of them. I especially had a hard time on the leg press machine. There is a world of difference between training alone and a having a demanding trainer looking over your performance whilst concerned about getting the best possible “10 secs up, 10 secs down” rep out of you. The Renex i-machines were a special challenge for me. Delivering that steady contraction at the neck and row devices was surely a difficult and stimulating task. And everything was being registered on the screen in front of me. I could not get away with cheating. 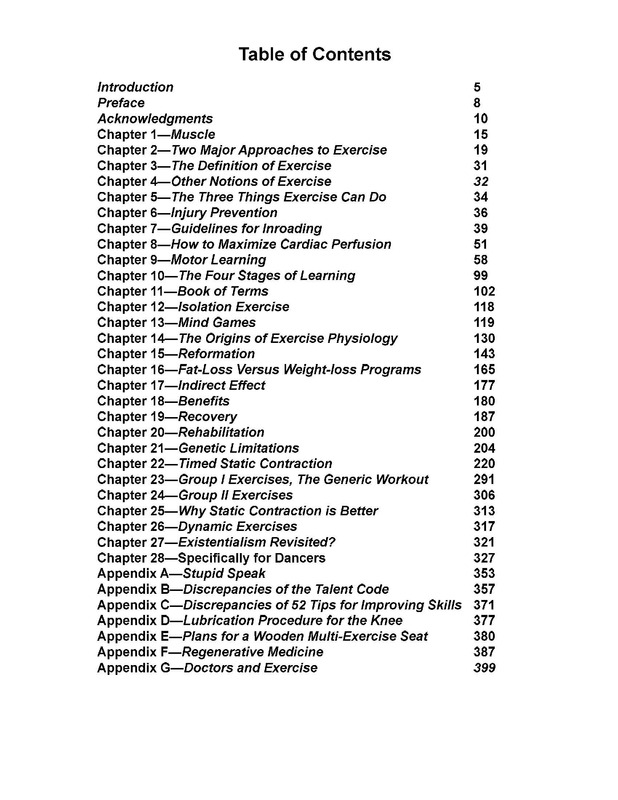 Well, in summary, what I am trying to convey with all this writing is that if you are interested in serious and effective strength training and want to improve your workout performance, I can tell you that it is worthwhile to stop by Beachwood, Ohio and spend some hours learning the Ren-Ex method at Overload Fitness with the undivided attention given by Josh Trentine. To the training and life success of everyone. This interview was done last summer for a Canadian cable television program called, “In The Gym”. The purpose of the interview was to discuss my competitive body-building history, although more specifically to discuss the genisis of my training as it relates to RenEx. The show was filmed at STG Strength and Power in Canada. This is a very well equipped gym, one of the most fascinating I’ve ever seen, however not for the purpose of performing SuperSlow/RenEx protocol. The producers informed us that we had time to film two demonstration exercises. We were able to find two pieces in the gym that are quite effective for the SuperSlow/RenEx protocol. We chose the Nautilus Low Friction Series Torso Arm and the MedX Avenger Leg Press. As compared to the vast array of vintage Nautilus machines, the two exercises we chose were best for our purposes, due to their lower friction and more congruent resistance curves. These machines turned our to be best case scenario in this environment and I feel we did a good job of representing Ken Hutchins original SuperSlow protocol. I hope everyone enjoys the piece. 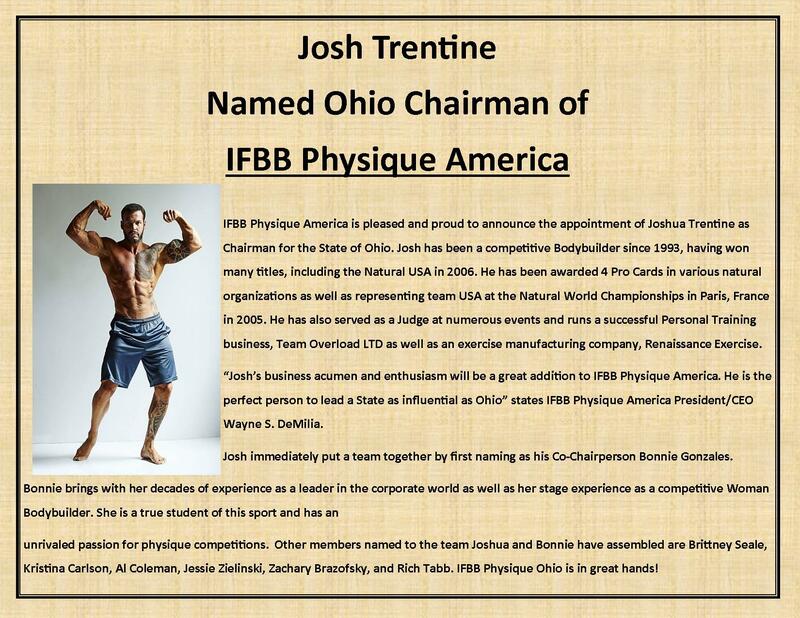 After spending 5 years as an Overload exercise instructor under Josh Trentine where I was able to transform my physique in the natural bodybuilding competition scene, winning many weight class divisions with Josh with only 40 minutes a week of training, I had an opportunity to follow my life-long career field in law enforcement. 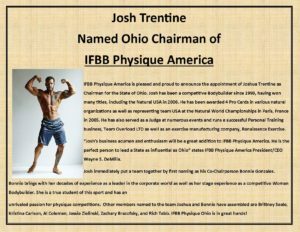 In the summer of 2011 I hung up my career in personal training at Overload and attended the Ohio Peace Officer Training Academy. The physical training requirements were not easy by any means and while many other classmates were spending hours upon hours in the gym each week, I stuck with the high intensity training (HIT) principles that of Overload Fitness. Due to time demands to study, my strength training reduced to just 1 workout per week and 1 cardio session a week to practice for the state required run. Along with a quality balanced ratio diet that is also prescribed by Overload Fitness I was able to maintain excellent conditioning and pass all the physical tests with flying colors. Exercise for me since a teenager was always about feeling good and being healthy. Anything else that came with it was a bonus. However, after stepping out into the streets of law enforcement for the very first day, exercise took on a whole new meaning. MY LIFELINE! A good instructor in the police academy told our class one day, “Your physical appearance and conditioning may make the difference between life and death someday”. That has always stuck with me and I thank God daily for the opportunity to have trained and worked at Overload Fitness because it has yielded me the injury free conditioning, agility, strength and speed that has saved me from serious physical harm countless times. Things can go from 0 to 60 in a blink of an eye, there is no warm up time, one must be ready to go at the drop of a hat. Overload high intensity training has allowed me the best chance of doing that and why I have been training it with it exclusively for the past 10 years. To this day I am still performing (2) 25-30 minute full-body strength training sessions per week that are spaced out 3-4 days apart. Additionally within the week I perform (1) HIIT cardio session (to train “event specific” for my needs, aka: sprinting after a fleeing suspect during a foot pursuit). Between 12-hour shifts, monthly rotations working days/nights, and as a husband/father I do not have any more time to spend exercising, yet I need that vice in life to positively cope with the irony of the world. High intensity training has allowed me to do that. 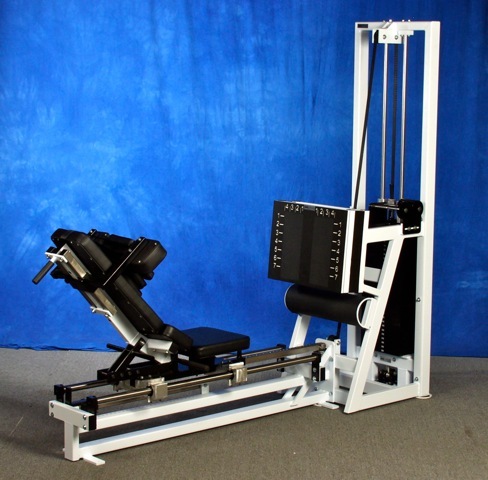 Additionally, the specific rehabilitation equipment Overload Fitness has especially in the area of lower back and neck are immaculate. Wearing 30lbs of equipment and gear for 12 hours under stressful conditions and positions each day can take a toll on the body if not properly trained and conditioned. Though my bodybuilding competition days are over and replaced with being a full time police officer, father of three boys and husband, I have never wavered in my training methods and living the lifestyle. I have even introduced my oldest teenage son to HIT for his own workouts. To conclude, anyone on the fence about whether Overload Fitness and its principles can work for you I encourage you to give it a sincere, full blown effort. I have even helped pass the knowledge on to my fellow officers in their workouts because I believe in it that much and wish them the same health blessings as me because I need to count on them as well in situations to make sure we all go home. Leave your hesitation at the door and commit. I have seen it change the lives of many without pain, injury free, and in fractions of the time. My final thought: After entering law enforcement I could have picked any exercise method out there especially considering it may make the difference between coming home one day or not. Even now, when my health and fitness are my lifeline, and everything is at stake, I trust and believe 100% in the high intensity training of Overload Fitness… Best of luck! The first week in July I took on a project refining the exercise techniques of “advanced” trainees. These work shops were only open to those having competitive bodybuilding experience. Below I share a thoughtful review from one of the Muscle Camp attendees. I am giving much thought to doing more of this kind of work, I really enjoyed it. I’ve come to find out that most anyone who trains isn’t quite as advanced as they think they are, which leads me to my primary interest, which is improving the qualitative aspect of exercise performance. It is my opinion that this concept of getting better at exercise far exceeds what can be achieved as compared to the P.R.E. (Progressive Resistance Exercise) model. I believe that the P.R.E. model has very little use beyond the beginners stage and the focus should be geared toward progressive quality of exercise for long term sustainable gains….and this is what Muscle Camp 2014 was all about. Subsequent my participation in Muscle Camp I documented some of the things I learned and experienced. I have made great strides in my training and nutrition from the knowledge that I gained from Muscle Camp and I am eager to return. Previously I trained biceps by selecting various ‘biceps’ exercises that I have learned about either from previous trainers or online research. I had an arsenal of exercises that I would incorporate to, for lack of a better phrase, ‘keeps my body guessing’. An old injury prevented me from performing different shoulder exercises. With the direction of JT, my injury is nothing more than a memory and I am performing at full capacity. Prior to muscle camp I believed I was performing side lateral raises, upright rows and rear delt lateral raises close to perfection. As he watched me perform lying side lateral raises; once my muscle tired the plane shifted allowing the rear delt to take on some of the work. That was corrected. Rear delts, the muscle I wanted to target was only slightly being engaged until after he made adjustments to direction in which my elbows should be following. For every exercise I was asked to perform the way I normally perform. Within moments of my placing my hands on the bar/weight/DB I was stopped. Set up is everything; every foot placement, hand movement and head position must be properly set before I could even begin to come in contact with weight(s). If the set-up is off, the set will be off. Before muscle camp I noticed that in the middle of my sets I would realign my hands, arms, feet, etc. because I did not spend the appropriate amount setting up. The majority of my workouts are comprised of compound lifts; basic lifts like dead lifts, pull ups, chest press, etc yield the best results for me. My rep ceiling has been removed; I perform as many reps as I can with consideration to stop between 8-12 reps. My set range has also increased from 3-4 sets to 5-8 sets depending on the exercise. I don’t stop at a ‘specific’ number; I keep going until my quality has been compromised or my strength diminishes. There is so much information and misinformation on squats and the execution of the exercise; I was putting a lot of it to the test. One week executing it this way, the next week I would execute it the next way. Regardless of how I did my squats, invariably I was just simply not performing the exercise in a manner that allowed my muscles to develop to their full potential. With my femur being longer than a typical person with my same stature, it makes performing a ‘perfectly’ executed squat more challenging. So, we did them all…front, sissy, back, etc. We used various bar lengths, elevated feet, and different combinations. The very last squat, performed with a cambry bar allowed me to finally perform a textbook version of a squat and more importantly stimulate the muscle my quads, hams and glutes. Squats begin with the ankle. My order on leg day has been reversed; I begin with calves and then move toward exercises that prepare me for my last exercise of the workout squats. Follow a good diet. What is a good diet? Chicken, egg whites, tuna, brown rice, broccoli, steel oats, and sweet potatoes? Sure, I could drop much of my excess body fat using the aforementioned foods as my primary food choices. But, how long will that last? For me, typically Monday through Thursday; fall off the wagon for Friday, Saturday and Sunday just to start all over on Monday. In fact, why don’t I just eat ALL of my favorite food this weekend that way I can ‘get them out of my system’ before starting a new chapter on Monday? I did that for years and needless to say that yielded exactly zero progress. Previous to muscle camp I spent thousands of dollars on an array of anything related to weight loss; pills, drinks, meal plans, and weight loss doctors. My weight would drop and then the pendulum would swing the other way and the weight I lost had found me and then some. I like to eat; it’s my cross to bear. So why am I eating all of my favorite foods and losing weight now? By being smart about my foods. JT designed my meals/macros around what would work best for me; based on my weaknesses and based what I could do consistently for the rest of my life. He prepared delicious, succulent burgers that would make most anyone want to give their compliments to the chef and all with 1 gram of fat. His recipe for breakfast sandwiches was no different. I enjoyed ice cream, chips, soda and an incredible homemade pizza that had approximately 10g fat and 60 carbs for the entire pizza. One of my favorite meals was the ceviche; raw chicken with pineapple mango salsa over a bed of warm white rice. Muscle Camp has taught me not only how to eat in a way that will be help me achieve my goals but it has taught me how to do it for more than 12 weeks; my meal plan doesn’t come with an expiration date. There is further conversation regarding this post over on the Inner Circle – if there are any topics you’d like to see expanded on, leave comments there. 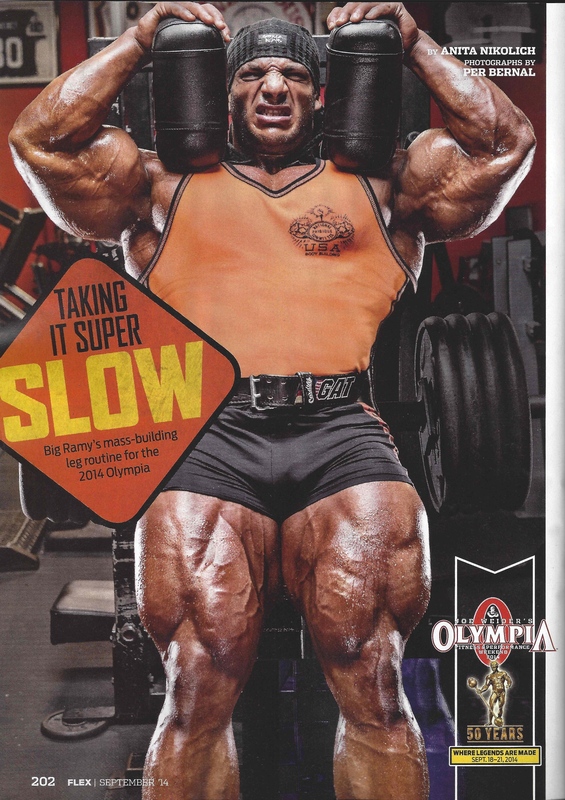 Over the years I have been aware of the existence of SuperSlow protocol derivations used by some IFBB Pro Bodybuilders. The latest incarnation of these derivations has popped up in the latest issue of Flex magazine (even though the magazines description of its use is quite a bit different from the videos that I have seen online of these same bodybuilders employing it said protocol). Below, I will summarize my understanding of how the technique is being used by the aforementioned bodybuilders. My summary is based less on the Flex magazine article itself, and more on the videos I’ve seen online, as well as a conversation with one of the bodybuilders in this circle. On The RenEx Inner Circle website, I will explore this topic in greater detail and add my suggestions for a hybrid protocol that can be used in a conventional setting. I think that my suggestions will add to the efficacy of the suggestions in Flex. In the current piece I merely want to present a brief introduction and a few thoughts. The easiest way to translate these bodybuilders use of the protocol is to reference The SuperSlow or RenEx technical manual and read Ken Hutchins’s description of timed breakdowns therein. From what I can derive, these bodybuilders start off by performing 3 SuperSlow reps. I believe this amount is on the edge of what any of these guys will be able to concentrate effectively, given their paradigm and orthodox bodybuilding equipment/environment (example: 45 degree Hack squat machines). Following their best attempt at 3 SuperSlow reps, they break from a SuperSlow cadence and begin performing their more orthodox 1/1 rhythmic repetitions (which is what you would commonly observe them perform). In practice they do not desire, nor is it likely that they are capable of in that environment, working toward any thorough inroad. Rather they extend their sets by speeding up, using momentum and employing pre-stretch. Note that within this paradigm bodybuilders don’t attempt to render their musculature momentarily incapable with one single set of exercise, but rather stop short in order to be able to perform multiple sets in order to derive an accumulative effect. When working within the RenEx system there is a different give and take. We are opting to take the musculature as far as it can go within a set, which allows for very little, if any, repeated attempts. I do believe to a great extent, that equipment will largely dictate ideal protocol for said circumstance. Within the context of RenEx and its early iterations, we discovered that breakdowns offered no additional benefits. Much less in terms of work was possible as equipment and methodology became more refined. Instead, we pursued inroad technique that would render the musculature incapable of either timed or traditional breakdowns. Furthermore, the development of thorough inroad technique rendered one incapable of pre-stretch. We now believe that with our environment and protocol, that both Pre-Stretch and Timed Breakdowns are unnecessary, undesirable, and impossible. Please do view this within context as our model calls for the intent to inroad the targeted musculature in a minimum amount of time. Their model calls for avoiding efficient inroad in order to prolong the exercise session and achieve multiple assaults. One could even say that their objective is in direct opposition to ours; to make the workout as long as reasonably possible.Either way there is always a give and take, and while I do have some potentially valuable insights for any camp who is trying use a SuperSlow type protocol to improve the quality, concentration, control and stimulation of their training, I think the audience for such insights could simply be this: those who are looking to perform better and further refine the qualitative aspects of their exercise practice. This is a subject I really want to expand on going into the year 2015 after I get past the Pro Mr. Universe Contest late this year. See you over on The RenEx Inner Circle for further discussion. Comments here will remain closed. Not a member of The RenEx Inner Circle? Simple. Join here for only $1. I own a blue book. 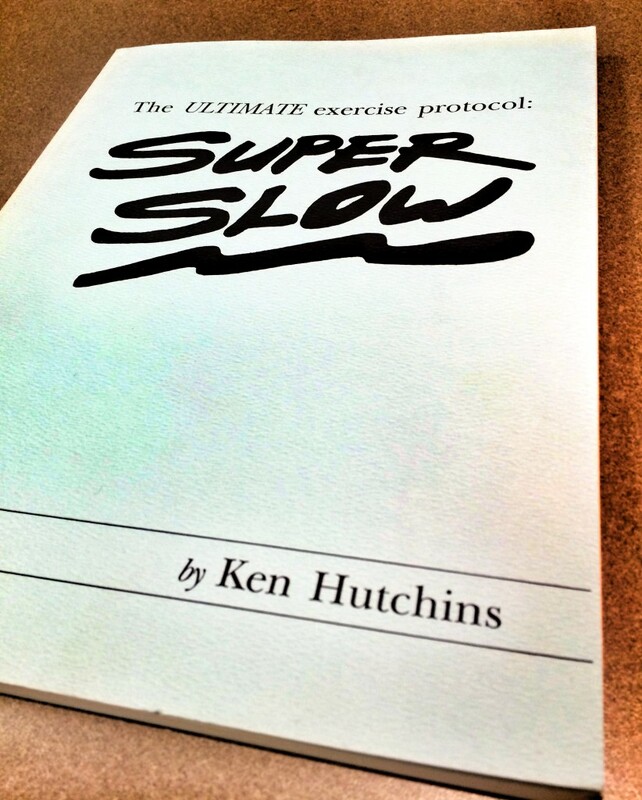 No, not the Kelly Blue Book that one might look up the value of a used car in, but an original blue covered The ULTIMATE Exercise Protocol: Super Slow by Ken Hutchins. This is the first edition of what would later become the Super Slow Technical Manual and eventually ROE Volume 1. Josh Trentine picked this up for me as a gift during one of his visits to Ken’s studio, and I must say it is one of my prized possessions. I mention this collectible of mine because it made me realize an important constant that has been in place within our protocol over the last 30 years. Unfortunately, I don’t think this constant has ever been (nor may it ever be) appreciated for its profundity both as a guiding principle and as an intellectual exercise/research tool. I would go as far as to say that those whom interpreted this constant correctly “got it”, while those that didn’t blamed their lack of success with the protocol on the protocol and the speed of movement. Hey, people want something to blame. 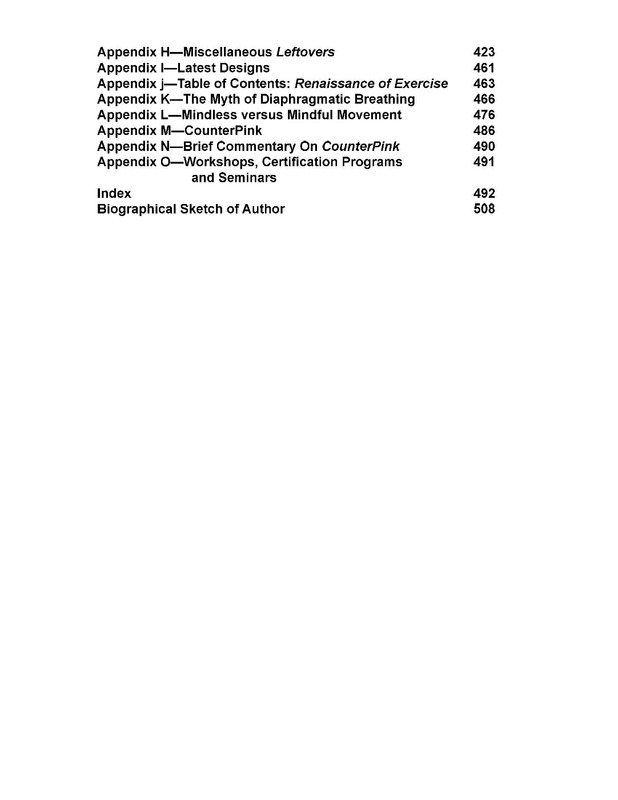 The “blue book” that I mentioned above has in its appendix “Super Slow Protocol Second Edition –Ken Hutchins- 1989”. As the title details, this is the protocol paper that explains how to execute the protocol properly. 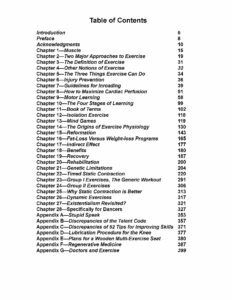 While technical, it is meant for the lay person to read and comprehend and serves as an unparalleled introduction to properly performed strength exercise. A protocol paper of this nature has been included in each version of the technical manual, although its contents change slightly with each edition. Through all the incarnations of this protocol paper one area of text has remained constant. The second paragraph of the protocol paper starts off thus, “As a beginner, ask yourself, ‘How slowly can I move, yet not stop?“‘. I’m half inclined at this point to stop writing and to see if you can guess where I’m going with this, but I want to dissect this simple question and try and make an argument for why it may be the most important thing Ken ever wrote as it related to exercise execution (and maybe the most important thing he ever wrote period). How someone responds to this question is very telling of their capacity to comprehend exercise. First off, the most important thing about this question is that it is a question. The words would not hold the same instructional power if they were said as a mere statement such as, “Move as slowly as you can without stopping”. A statement of this nature is likely to get completely ignored or at the very least, misinterpreted. A question, on the other hand, is an undervalued concentration tool to focus the mind. I get a lot of inquiries about how to mentally prep oneself for an intense workout, but no technique I know of works better than a properly posed question. If you look closely the next time you are asked a questioned that demands an answer that is not reliant on rote memorization, you’ll notice the first thing that happens is that you don’t have an answer. This creates a gap that makes you become intensely present momentarily. With this information in mind, what better way exists to get a novice to follow a set of instructions than to ask them to do something that forces them to focus? If you look again at the question Ken posed, it really is very brilliant. This isn’t the type of question that has a conceptual answer however (although you must engage the intellect). You must present the answer physically moment after moment throughout the duration of the exercise. Lapses in concentration will result in a failed answer. The subject is being asked to investigate experience on a number of different levels in order to completely answer the question. In the second part to this article I will dissect each word in the question and show why its structure might just be the key realizing the real objective.